Whether you’re practicing indoors or outdoors, here’s a great hitting drill that will help your players hit the ball up the middle! The setup for this drill is pretty simple, but simple doesn’t mean easy, as your players will soon discover doing the Ride the Net drill. The more your players hit the ball in fair territory the greater chance they have for base hits. And while players love to hit the ball hard, most of them do so foul…which doesn’t help anyone except the pitcher. So here’s a great drill I learned from Rachel Lawson, Head Softball Coach at the University of Kentucky, that is designed to help your players focus on hitting the ball straight ahead – or Up the Middle. To setup, all you need is either a batting cage, or else a straight fence line, a batting T, and a bucket of balls. If you have a protective screen then you can do Righty’s and Lefty hitters or slappers together – which means you’ll need 2 batting T’s and 2 buckets of balls. 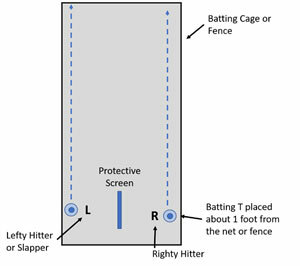 Place the Batting T’s a foot (12 inches) from the side of the net/fence, and if using a Righty and a Lefty hitter or Slapper at the same time, then place a protective screen between them. Each hitter hits the ball off the T, and the object is for the ball to travel the length of the net or fence, staying the same 1 foot distance from the net – in other words, to Ride the Net. This sounds easy but will take your players a while to get the hang of it. You’ll quickly discover there’s a different between simple and easy; the setup is simple but the drill is not easy.